Baldwin has a 60 year legacy of craftsmanship and innovation. Rated #1 in quality by builders and contractors, Baldwin is pleased to offer a line of luxury hardware for the discriminating consumer, our Prestige Series. Feel the difference - Baldwin hardware is solid throughout. With a 60 year legacy of superior style and quality, Baldwin is the choice for an elegant and secure presence. Nautica's clean flowing lines and smooth, windswept curves add just the right touch of coastal charm. This single cylinder handleset can be locked or unlocked by a key on the outside, or the turn button on the inside. Tobins refined curves and sleek contours are delightful to the eye and pleasing to the touch. The crisp, clean appearance of the Satin nickel finish adds to the overall look of the product and brings a modern feel. SmartKey Re-key Technology allows you to control who has access to your home. With this Electronic Camelot Handle Set paired with an Accent lever in Satin Nickel you don't have to worry anymore about hiding keys under the doormat. No more losing, forgetting, or making extras keys time and time again. Step up to a more secure and flexible solution with Schlage electronic security products. Youre free to add, change, or delete user codes in just seconds and to come and go as you please. Prestige Nautica Single Cylinder Satin Nickel Handle Set with Tobin Lever and SmartKey Baldwin has a 60 year legacy of craftsmanship and innovation. Rated #1 in quality by builders and contractors, Baldwin is pleased to offer a line of luxury hardware for the discriminating consumer, our Prestige Series. Feel the difference - Baldwin hardware is solid throughout. With a 60 year legacy of superior style and quality, Baldwin is the choice for an elegant and secure presence. Nautica's clean flowing lines and smooth, windswept curves add just the right touch of coastal charm. This single cylinder handleset can be locked or unlocked by a key on the outside, or the turn button on the inside. Tobins refined curves and sleek contours are delightful to the eye and pleasing to the touch. The crisp, clean appearance of the Satin nickel finish adds to the overall look of the product and brings a modern feel. SmartKey Re-key Technology allows you to control who has access to your home. 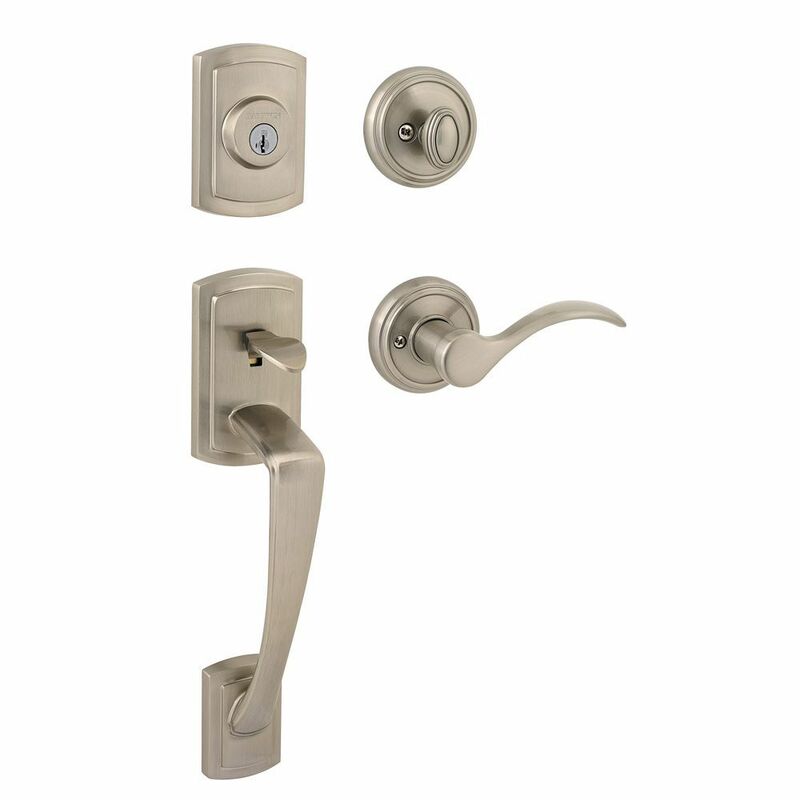 Prestige Nautica Single Cylinder Satin Nickel Handle Set with Tobin Lever and SmartKey is rated 4.0 out of 5 by 46. Rated 5 out of 5 by VPFH from So far, so good. It has the look and feel of high quality. Hoping it holds up over the years. So far, so good. It has the look and feel of high quality. Hoping it holds up over the years. Rated 5 out of 5 by Gman from Product was easy to install, used the same layout as the other brand it replaced and was very not... Product was easy to install, used the same layout as the other brand it replaced and was very noticeably of superior quality. Rated 3 out of 5 by Bobbi from This lovely handleset didn't fit my door and I'm extremely disappointed. After removing my older... This lovely handleset didn't fit my door and I'm extremely disappointed. After removing my older handleset, it left a hole that didn't match the new one. It requires an underplate to conceal the opening, which is all custom work. I'll have to return it, or get a new door! Rated 2 out of 5 by DIYDad from Maybe it was just the one I got, but it was faulty. I would think that they should last more than... Maybe it was just the one I got, but it was faulty. I would think that they should last more than 2 years. Look nice, but was not worth it for us. Rated 1 out of 5 by Smith from Like the styling. But could not get the door... Like the styling. But could not get the door handle attached. The tiny screw that needs to be removed and then threaded through the handle to secure it was stuck. Since I am not that handy, I had my brother-in-law, who works construction and is a handyman, install. He was well aware of the old lefty loosey, and still the tiny little screw would not come out with the provided allen wrench. Ultimately the screw head stripped and we now have to come up with a hack (and if that doesn't work, will then need to try to deal with the company). Rated 1 out of 5 by RosiePosie from I expected it to be decent quality. It lasted less than 2 years and then the spring gave out. YOu... I expected it to be decent quality. It lasted less than 2 years and then the spring gave out. YOu can not open the door with the thumb latch from the outside....Does anyone know if you can buy just the spring? Rated 5 out of 5 by Terry from Looks great, locks with ease, what more could you ask.... Looks great, locks with ease, what more could you ask.